Over the long weekend we drove up to the beautiful Lake District and stayed in the beautiful Southerdale Cottage. We managed to avoid the traditional lousy weather that London received and had great weather for a couple of walks from the really excellent Jarrold Short Walks book. We love walking in the Lake District. It’s a long drive from London but it is so totally relaxing it always recharges your batteries. On the Saturday we had fantastic weather and the walk up to Castle Crag was reasonably busy. We started in the tiny village of Seatoller beneath the terrifyingly bleak Honister Pass; one of the highest passes in Cumbria with a road gradient of 25%. From the summit of the rock the views are so singularly great and pleasing that they ought never to be omitted. The way back to Seatoller follows the crystal clear Derwent River through Low Hows Wood. On the Sunday the sky looked a bit rainier so we were practically on our own walking up the beautiful Rannerdale to the spectacular ridge leading to Rannerdale Knotts. In 1066 the locals of Rannerdale mounted a resistance to the Norman Invasion. Led by the Earl Boethar, the Normans were drawn into the valley and slaughtered by the native Britons. The bluebells that grow in the valley are said to have sprung from the blood of the slain Norman soldiers. The climb up Rannerdale was windy and occasionally rainy but the view of Crummock Water and Buttermere from the ridge was absolutely stunning. 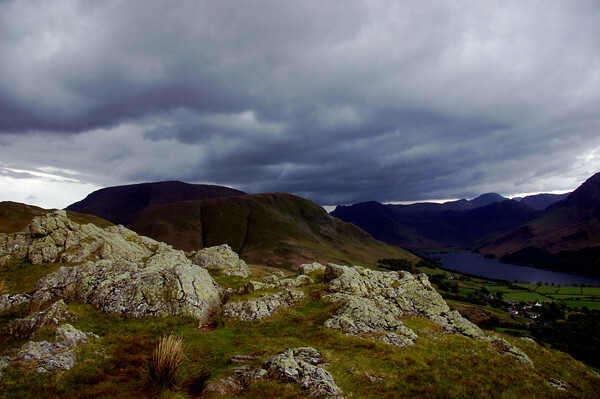 The low grey clouds that were sweeping across the fells made it look like we were staring into Mordor. Kathryn found a secluded spot overlooking Buttermere just as the sun broke free and the wind became calm. It was the most perfect lunch. We also took the time to visit a couple of National Trust properties. 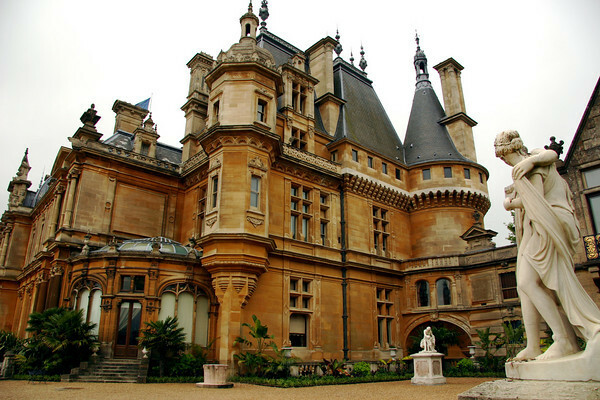 On the way up we stopped at Waddesdon Manor – a huge French château dropped into rural Buckinghamshire. Built by the literally minted Rothschilds in the 19th Century on land bought from the Duke of Marlborough it contains an impressive load of the Rothschilds’ fabulous collection including paintings by Gainsborough and Reynolds, Sèvres porcelain, Beauvais tapestries and a large number of French secretaires and roll-top desks. Queen Victoria visited in 1890. On the way south we stopped at Charlecote Park; a (very) slightly more modest Tudor manor house on the banks of the Avon near Stratford. According to legend, Stratford’s most famous resident was caught stealing deer from Sir Thomas Lucy’s park and years later he took his revenge by portraying Sir Thomas as the fussy Justice Shallow in The Merry Wives of Windsor. Like a lot of National Trust properties, Charlecote Park is still lived in by the current descendants of the original Lucy Family. Baronet Sir Edmund Fairfax-Lucy lives there now, presumably in one of those areas we’re not allowed to see. Interestingly, during the depression of the 1870s Henry Spencer Lucy (a crack shot with the 12 gauge) was forced to sell many of the more valuable Old Masters, some to Lionel de Rothschild around 1875. There are more pictures in the gallery. Hi i came across this page while looking at images of Charlecote Park, however the images that you use within this blog that you state are Charlecote Park are actually of Waddesdon Manor, a National Trust property in Buckinghamshire which is a house in the style of a 19th-century French chateau. Yeah you’re right. The pictures didn’t line up with the text correctly. Thanks for pointing it out. I’ve moved it around.